Following the success of our live commentaries, we are once again reporting from Paris here at The Arabian Magazine. Perfect for those at work who can’t watch the live feed itself, as well as those who want to enjoy a different angle to complement their viewing of the show, this gives you a real insight into the World Championships as they happen. 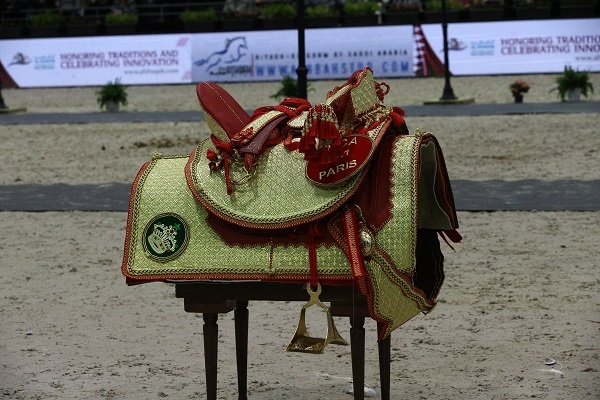 Check back reguarly for news, videos and photographs from this thrilling event – the Paris World Championships! It is time! 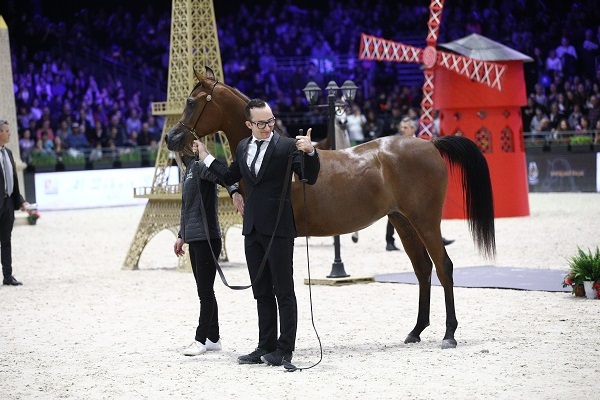 The 2017 Paris World Championships are taking place between 24 and 26 November and this year’s show is all set to be a year to remember. Check back regularly for updates from the show. SUNDAY 26 NOVEMBER – CHAMPIONSHIP DAY! I hope that you have enjoyed this coverage – here’s a beautiful parting shot for us all, showing the terrific bond between humans and their Arabian horses. 6.54pm: Equiborn KA also now is a World Champion title holder for the third time, I believe. 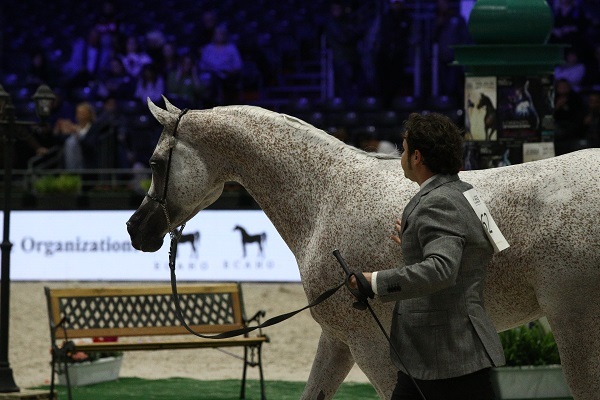 QR Marc is the sire of both the Silver and Bronze Champion in this section – both very different horses and both exceptional. 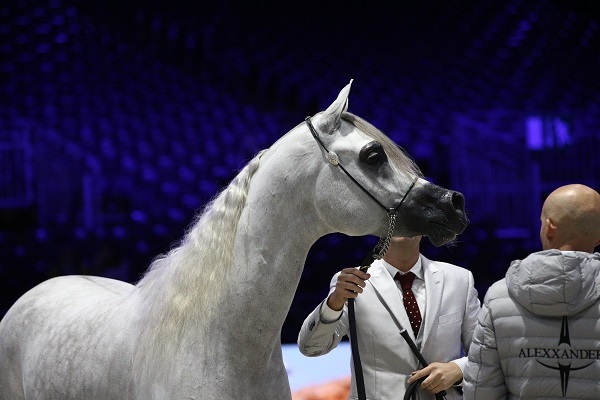 6.50pm: Wadee Al Shaqab is now a double World Champion. Congratulations to his breeders, Al Shaqab Stud in Qatar. 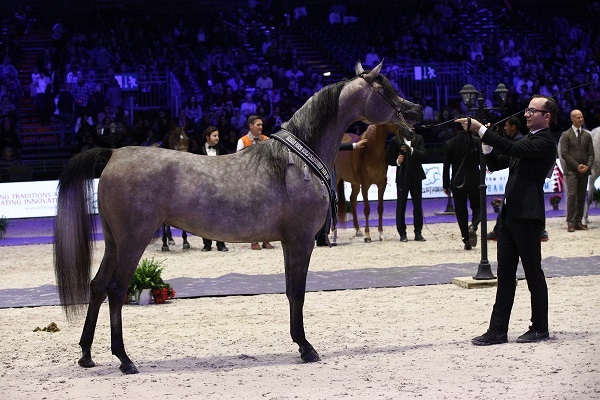 He is also the sired of the Yearling Male World Champion, Figaro. 6.48pm: The crowd truly made their feelings felt, with huge cheers for Equator. 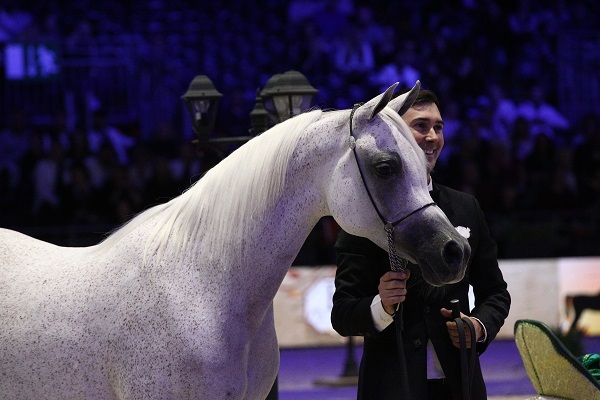 This is a horse that truly steals hearts, and he has been beautifully shown both here and in the US during his lease to Aljassimya Farm. 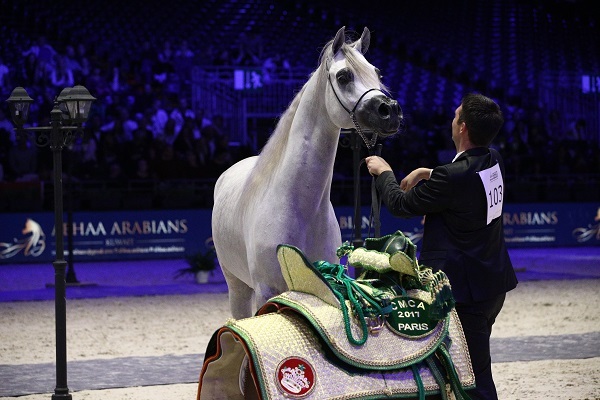 In the US, he was named Gold International Scottsdale Champion and Arabian Breeders’ Alliance World Cup Gold Champion. Gold here in Paris as a junior, this is his second Silver here. I truly hope his time will come – and with the same handler on the end of the lead, as they make a brilliant partnership. 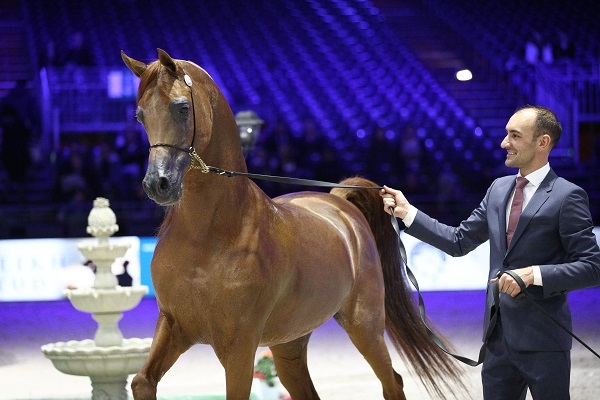 6.48pm: BRONZE SENIOR MALE WORLD CHAMPION – EQUIBORN KA! 6.47pm: Equator’s handler bowed to the audience as he came in – very gracious in defeat. 6.44pm: SILVER SENIOR MALE WORLD CHAMPION – EQUATOR! 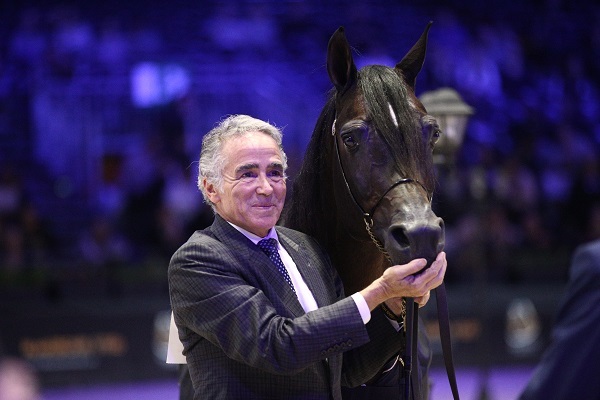 6.43pm: GOLD SENIOR MALE WORLD CHAMPION – WADEE AL SHAQAB. Not unanimous though – two judges went for Equator. 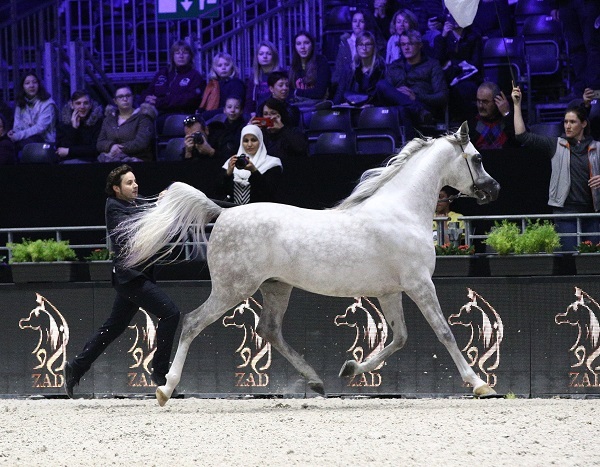 6.38pm: Gazal Al Shaqab, Platinum World Champion. Now 22 years old he, too. gets a standing ovation from the crowd. He has been shown by his lifelong friend, Michael Byatt, and it is a magical combination. Gazal possibly looks a little curious about all the fuss and attention but we don’t care. It is lovely to see him. This was a stallion who truly launched a dynasty, and to have the chance to applaud him and recognise this is just wonderful. 6.25pm: Of course, the show is normally done by now and the VIP section has definitely thinned out as people rush to get home. The change has worked well though, and the organisers are to be applauded for taking the brave decision to move the timings. 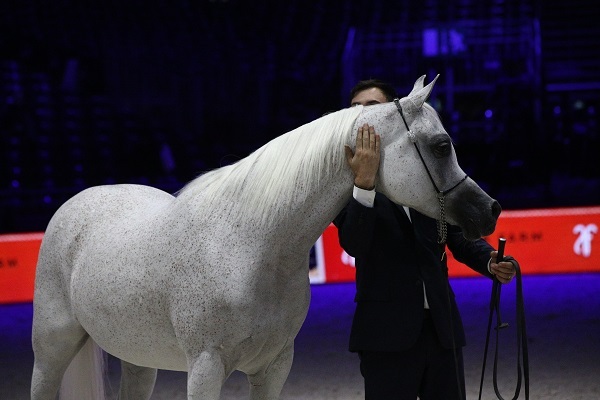 6.33pm: I imagine that Gazal Al Shaqab wil be presented with the Platinum Championship before they announce the Senior Male Championship. Meanwhile, Sire of the Show goes to WH Justice. 6.32pm: A couple more awards. 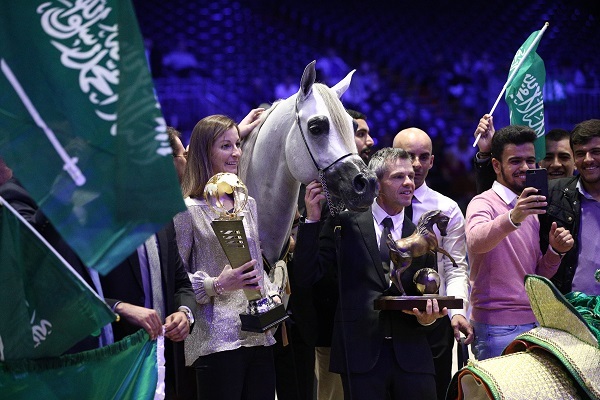 Wadee Al Shaqab is the high-score of the show, and Al Shaqab Stud are the Breeder of the Year. 6.30pm: Bronze Junior Male World Champion, Nadeem Al Arab. 6.29pm: Silver Junior Male World Champion, Fuerte. Here is your Unanimous Gold Junior Male World Champion, Alexxanderrr. 6.25pm: Stirring stuff!!! 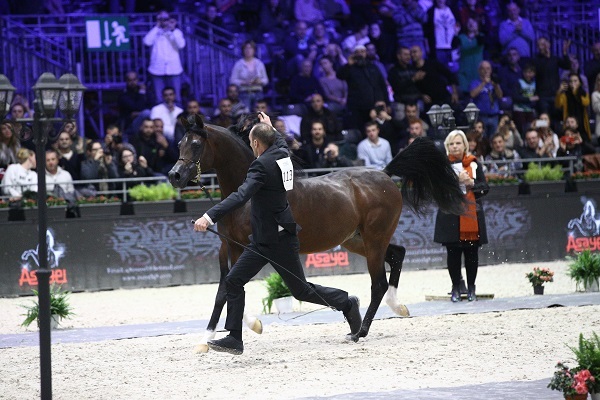 That beautiful, haunting version of The Sound of Silenceis playing, and the crowd is doing all they can to persuade the judges’ to choose their horse. Incredibly moving…. Add Gazal in the mix… Cue tears. 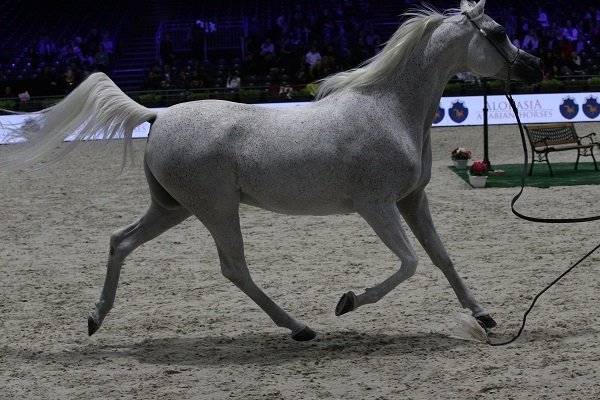 6.22pm: Gazal Al Shaqab is in the building! 6.14pm: Equator has just received a standing ovation from the audience duing his individual show! I think the crowd have very definitely made their favourite known! 6.12pm: That is fun – Alexxanderr was unanimous Junior Male Champion! 6.08pm: Now for the one everyone has been waiting for – the Senior Male Championship! 6.02pm: Finally, your Bronze Yearling Male World Champion, RD Harenaado. 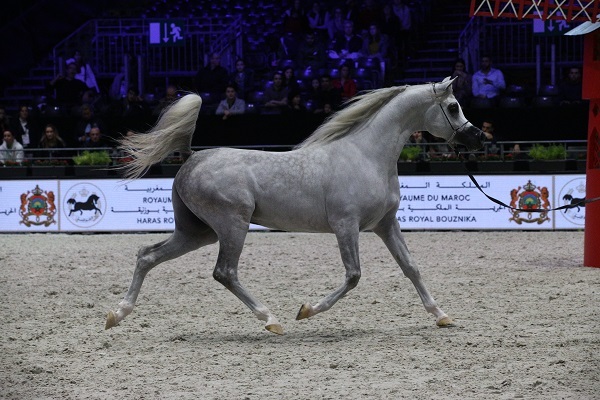 6.01pm: Just in time for the Senior Male Championship, here is Wadee Al Shaqab from yesterday. 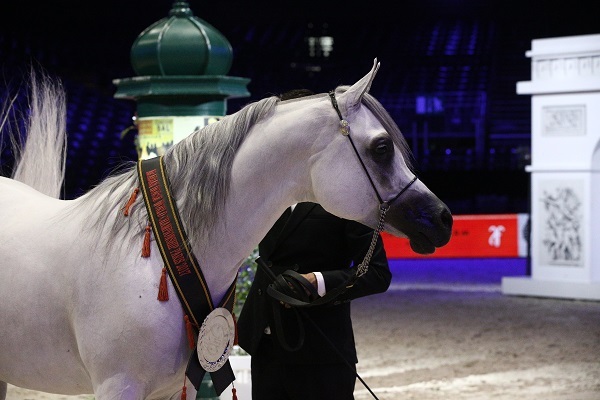 5.54pm: Here is your Silver Yearling Colt World Champion, HL El Ganador. 5.52pm: GOLD JUNIOR MALE WORLD CHAMPION – ALEXXANDERR! 5.42pm: The colts are being judged at the moment, so here is your Gold Yearling World Champion – Figaro. 5.23pm: Next in is the Junior Male Championship. Aljassimya Farm have won the Best Breeder Award. 5.20pm: The Mare Championship was very split – three went for Tehama Ballalina, three for Shirin by Aisha, and two for Delights Divah RB. I did think that it would be close. 5.18pm: And your Bronze World Champion Mare, Delights Divah RB. 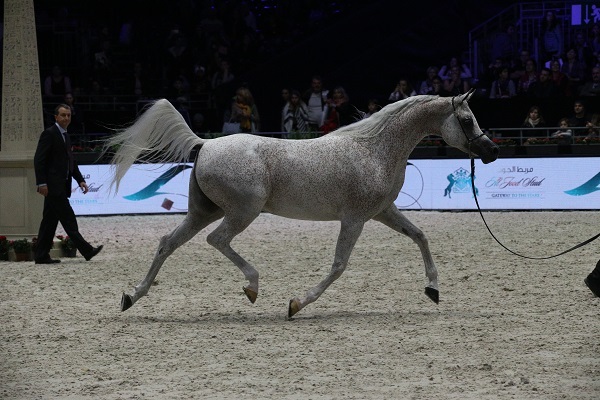 5.17pm: Here is your Silver World Champion Mare, Shirin by Aisha. 5.16pm: Sorry for the delay there, the wifi is terrible around the time they announce the championships as everyone tries to get online! 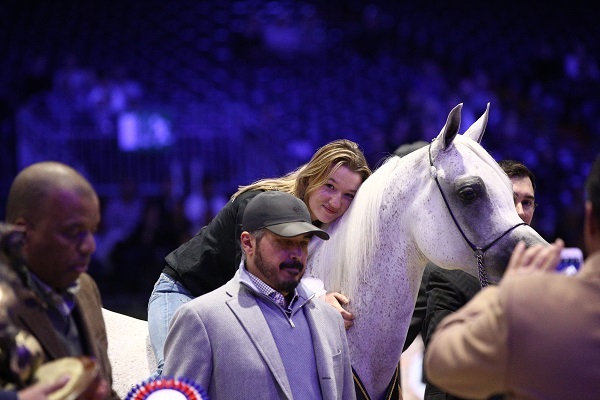 Figaro was a very popular choice – lots liked him in his class HL El Ganador has already enjoyed a successful season, and he will be back. RD Harenaado showed well to take a deserved Bronze. 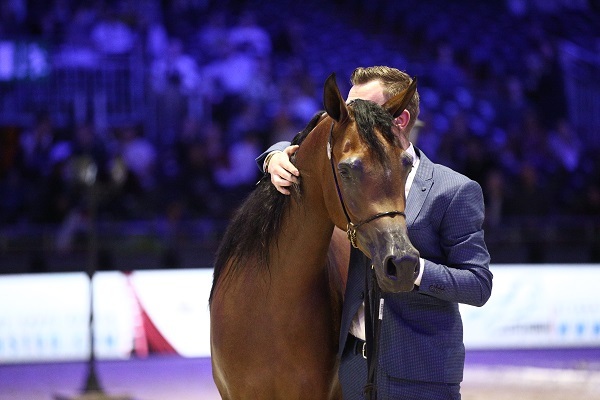 5.15pm: GOLD YEARLING MALE CHAMPION – FIGARO! 5.03pm: Here is your Gold Senior Female Champion, Tehama Ballalina. 4.36pm: A few tears here – Tehama Ballalina is a horse that so many of us in the UK know well. And she has just gone Gold in Paris! Shirin by Aisha is an incredibly worthy Silver, and it must have been close between them. Delights Divah has always delighted. A magical mare championship, congratulations to everyone. 4.35PM: BRONZE – DELIGHTS DIVAH RB! 4.34PM: SILVER IS SHIRIN BY AISHA! GOLD SENIOR FEMALE CHAMPION 2017 – TEHAMA BALLINA!!!!!!!!!!! 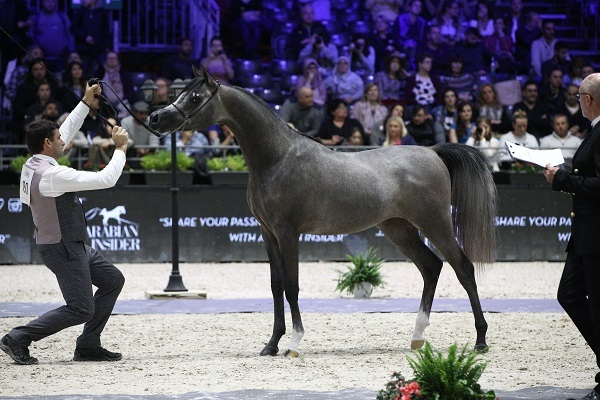 4.30pm: In anticipation of Gazal Al Shaqab later, here is our video of him from Aachen in September. I know that I am not the only one who cannot wait to see him today. 4.08pm: Just in time – here is Tehama Ballalina. 4.01pm: Oh, I am so pleased. Mozn Albidayer was Bronze here as a yearling, and then then Silver as a two-year old. 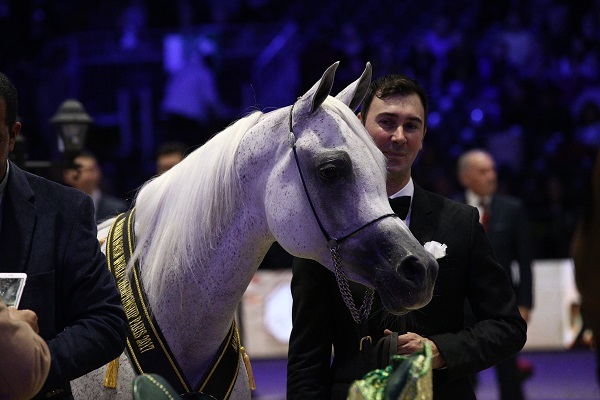 Third time lucky and she is Gold – and Albidayer Stud has their first homebred World Champion, continuing the great tradition of the United Arab Emirates. Mozn has been our cover star twice now, and I cannot wait to see her as a mare. She will be just sensational, and she also has the pedigree to breed on. 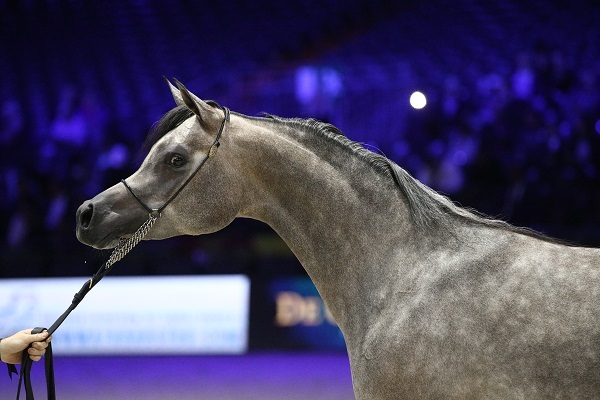 Madinat Al Baydaa has taken her second title in Paris, and is just two years old; could she make it a hat trick in 2018? And then Belladonna AT, one of the first homebred horses of Al Thumama Stud, and she justifies their faith and believe in their programme. 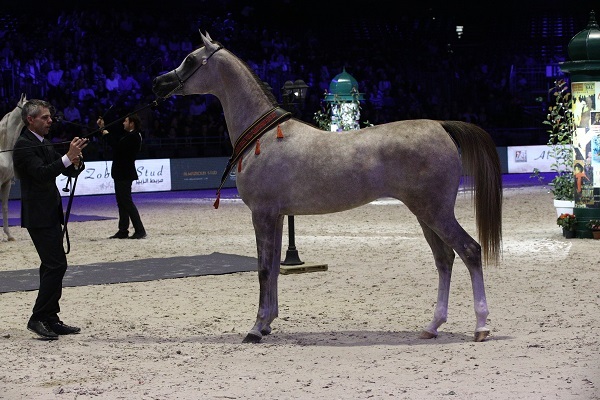 Of course, she is sired by Wadee Al Shaqab, who we will see later. The final photos are being taken, and next in will be the mares. This will also be thilling, with Tehama Ballalina, Shirin by Aisha, Delights Divah RB, Arwa Aljassimya, and Anood Al Nasser just some of the highlights to mention. Phew! 3.58pm: Something of a suprise that Beloved Gracious Lady didnt get anything but – Madinat and Belladonna are both extremely lovely fillies and deserving of these titles. Their connections must be overjoyed! 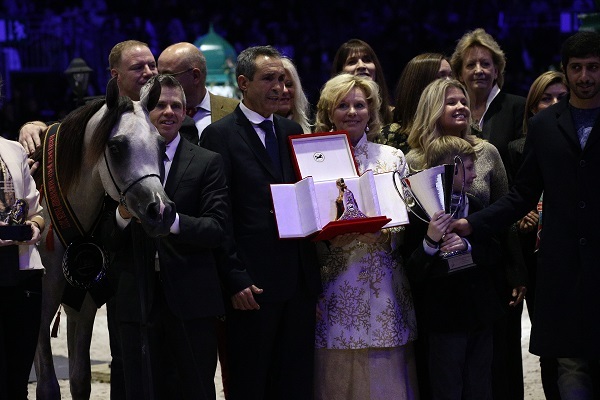 And what is also so lovely is that all three medal winners are still owned by their breeders. Congratulations! 3.57pm: BELLADONNA AT BRONZE WORLD CHAMPION FILLY! 3.56pm: MOZN ALBIDAYER IS GOLD JUNIOR FEMALE CHAMPION!!!!!!!!!!! 3.54pm: The heartbeat has started…. 3.50pm: The judges have had their allocated seven minutes to assess the horses, and they have now returned to the collecting ring. 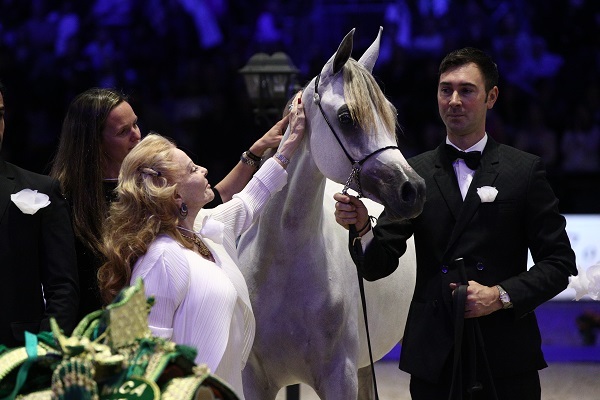 The fight here is surely between Mozn Albidayer and Beloved Gracious Lady – both incredible horses, and it is, naturally, down to those in the ring and under the spotlight to make the decision of who gets the coveted title. We can all have our favourites, but they are the ones with the power to make dreams come true. 3.48pm: SERANZA – SILVER WORLD CHAMPION YEARLING FILLY – and happy birthday Raphael! Great sportsmanship. 3.43pm: Right, the fillies have done their individual and are now in for the stand up. 3.32pm: The wifi is overloaded so bear with us please while we get news to you. Aljassimya Farm has just won Best Breeder. The Junior Female Championship is still underway – still with the same dreadful music. LR Era de Excalibur had six votes for Gold – Seranza had two. 3.25pm: The connections of all the horses are leaving the ring, bringing this first championship to its conclusion. I don’t know about you, but I am very happy with the result. Those three fillies are utterly beautiful, and all have big futures ahead of them. Well done to all breeders! 3.19PM: Wonderful scenes in the ring as the Saudi National Anthem plays for LR Era de Excalibur. She is, of course, owned with Al Sayed Stud and was bred by Estancia Las Rosas in Uruguay. 3.17PM: BRONZE – OM EL ERODITE! 3.16pm: LR ERA DE EXCALIBUR!!!!!!!!!!! 3.11pm: The fillies have just left the ring. All we can do now is wait and see who will be Gold. 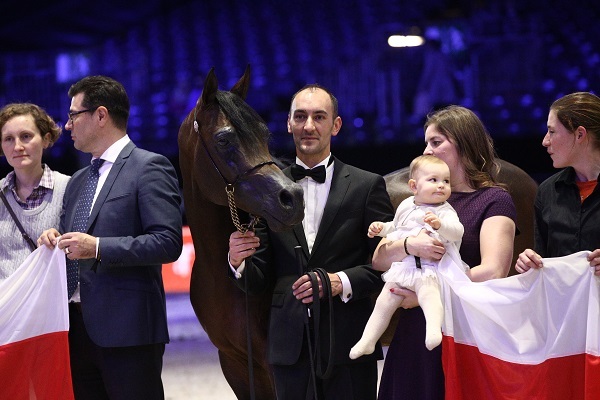 Will Uruguay get their first homebred World Champion? Or will the title go to the US and Om El Erodite? Just a few more moments and we will know. 3.07pm: The judges are making their way down the line, assessing each filly. I have to say, most of the handlers are standing their horses down as soon as the judges are passed, and the judges are moving down as one. This really does take the pressure off the horses and I think that this is something that ALL shows should bring it. 3pm: Sorry to continue in this vein, but this music really isn’t helping anyone concentrate on the horses in front of them. 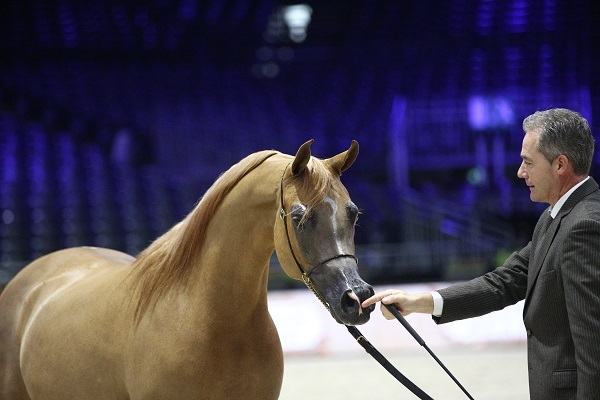 We have a very beautiful bay in the ring now – Haifa ED – and with base lines and electric guitar going through your head, it is very difficult to focus. I feel like I am at a rock concert, not the World Championships! Last filly now due in and then it is the stand up phase of judging. 2.55pm: Honestly, you have some of the most beautiful fillies in the world here and there is no grace to the music thumping out! We have had Gimme Shelter before, which was fantastic. This is David Gilmour One of these Days live and it is not at all suitable for the majesty and beauty we are seeing before us. 2.52pm: To utterly hideous music, LR Era de Excalibur opens the show. I have goosebumps… Here comes Om El Erodite, to huge applause. This is going be highly competitive – although the music is just dirge and might quite quickly send us all mad. 2.39pm: I am happy to share our first video of the show with you – yesterday’s showing by Equator. Please enjoy! 2.38pm: Right, while they do the Can Can, let’s get a handle on today. We have the female championships first, and then the male. Many feel that some of the championships are a foregone conclusion, but you just never know what all eight judges will do together. 2.35pm: This is quite the sight – handstands and frilly knickers at the ready! I wonder what our American visitors make of this – perhaps they should bring the Moulin Rouge to Vegas? 2.33pm: Wow, it is tense outside. 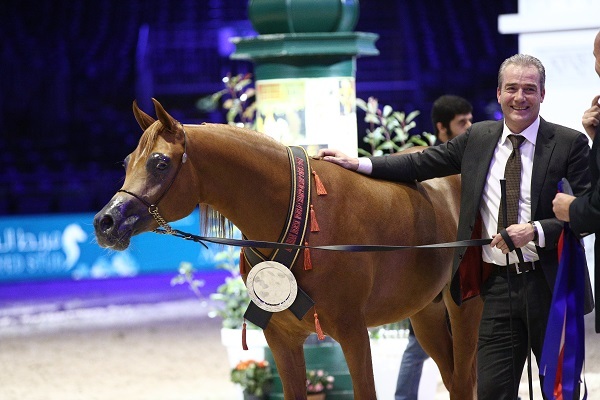 All the handlers are trying to remain calm and carry on as normal, but this is the biggest day of the year in the Arabian showing world and the nerves are definitely there. The opening ceremony is about to begin, and we have the Eiffel Tower, Moulin Rouge and Champs Elysee all in the ring. And now the Can Can girls are starting the show! Thankfully, no tassles in sight! 2.32pm: LIVE! Time for the 2017 World Arabian Horse Championships to begin! 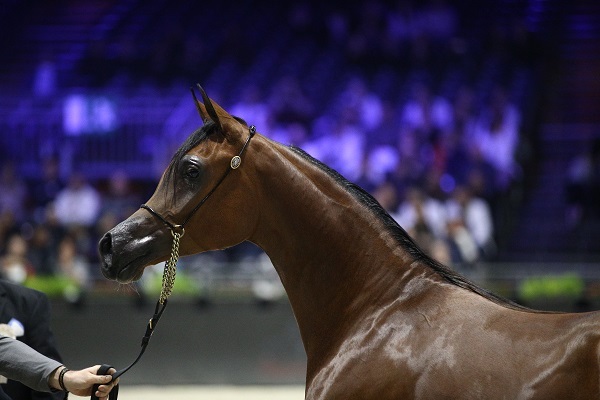 11.14am: The final word before I get ready to head to the show… GAZAL AL SHAQAB (Anaza El Farid x Kajora), bred and owned by Al Shaqab Stud, will be taking part in the Platinum Championship today. There are no mares forward, which is a shame, and Gazal is the only stallion forward, but it will be absolute treat to see him. Definitely something to look forward to amid all the drama of the day! 11.05am: Before I go any further, however, I do need to talk about one handler yesterday. Sian Beeley from the UK, and still a teenager, spent the summer working with Johanna Ullstrom in Belgium. It is well known that Johanna runs a brilliant and encouraging amateur programme, and Sian was able to benefit from that this summer through sponsorship from Australian judge, Graham Smith – who also keenly encourages the amateur handler. 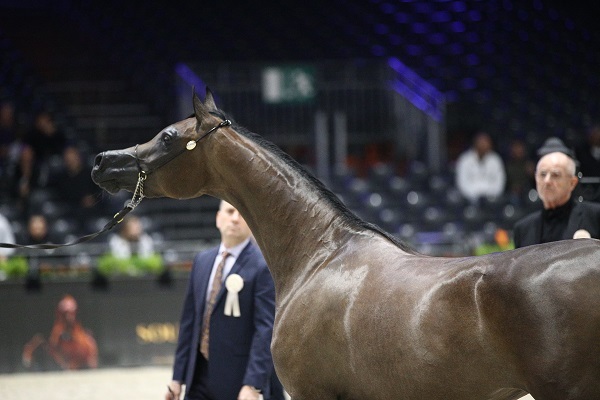 Yesterday, Sian showed her mother’s stallion, Versaali (Versymiaan x My Midnight Dancer), bred by Elizabeth Mitchell and owned by Samanthe Beeley, in the first incredibly strong stallion class. 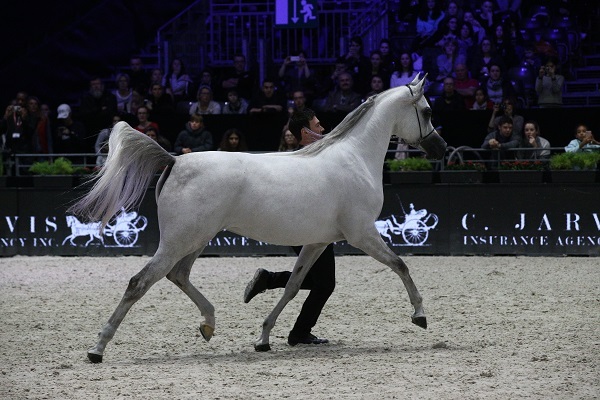 In her Paris debut, Sian and Versaali earned a 20 for movement from the judges, and she showed her horse beautifully, with confidence and grace. Definitley a handler of the future, and one to look out for. Congratulations Sian! 10.59am: Good morning all! I have been struggling to log on as the site is under heavy load, but here I am at last. There definitely is something to be said for the show starting later. I have George Michael playing in the background, the brilliant Paris sunshine outside, and my mind is very much on what today may bring. Equator is certainly the horse that everyone was talking about yesterday. 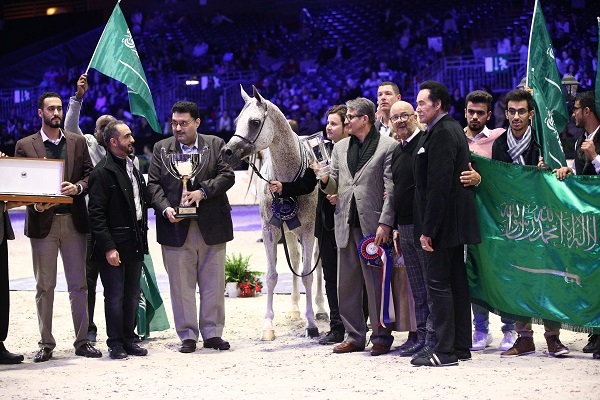 But we have the fillies first – that Yearing FIlly Championship, and then Mozn Albidayer will be looking to go one better than she has on last year, by taking Gold Beloved Gracious Lady will definitely give her a run for her money, and it will be thrilling to watch. 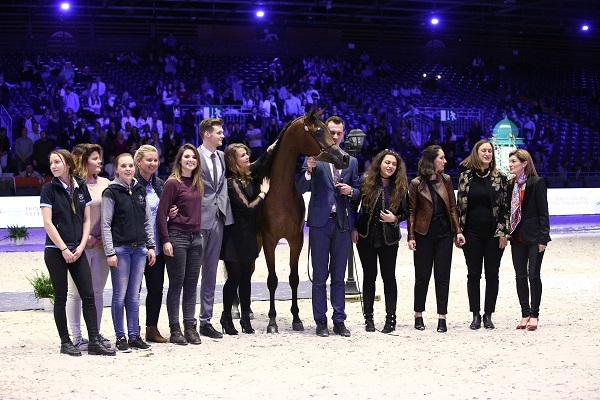 And then the mares… Today is certainly full of potential to be a very memorable World Championship day! 2.19pm: That’s all for today! I hope you have enjoyed the coverage. The Championships are tomorrow and start at 2.30pm (GMT+1). See you there! 2.17pm: And here he is – such a happy photo to end today’s coverage with! 2.12pm: The final awards are just being presented. As soon as Marilyn is back, I will be posting a photo of our winner. She has done great work this weekend, running up and down between our table and the collecting ring! 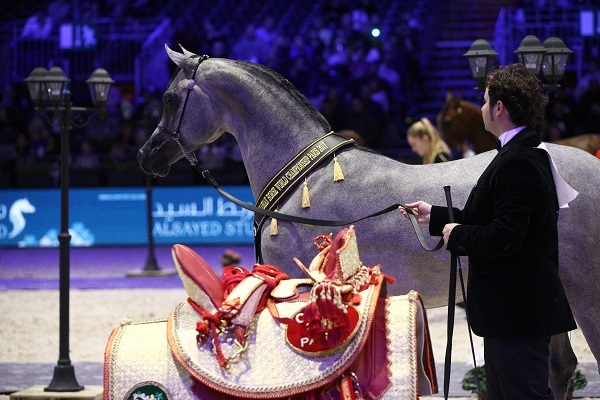 2.04pm: The best straight Egyptian in the show is Wadad Zamani (Laheeb x Zena Al Buraq), bred by Osman Al Kasasi of Israel and owned by Hanaya Stud of Switzerland. Congratulations! 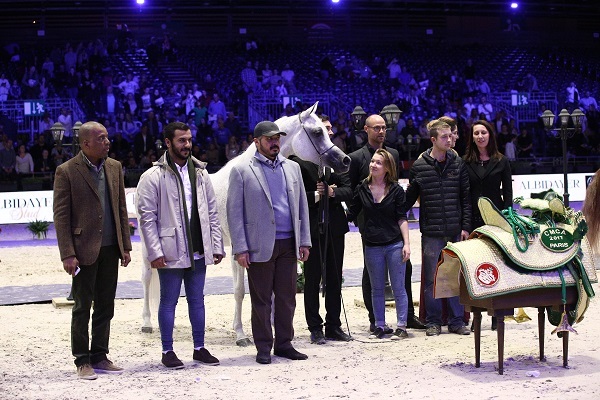 RHR Heir of Marwan has won the cass, with Van Gogh AM in second place, Kabsztad in third, Safeer (Ajman Monsicione x MO Sajfa), in fourth with 90.42 points and Valmir Mal (AMir Ashiraf x Valenka Lip) fifth with 90 points. EQUATOR wins the Best Movement Male Award. 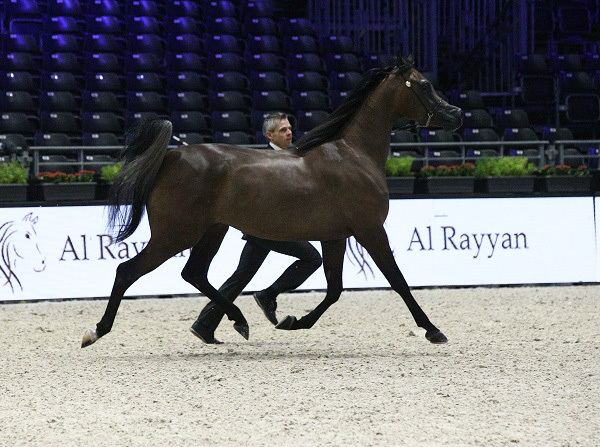 1.58pm: RHR Heir of Marwan (Marwan Al Shaqab x LC Psychesheiress) has just gone into the lead with 92.8 points. Bred by Roger and Stephanie McMahon in the US, he is owned by Southern Chariot Stud of Australia. He has the honour of being a horse I have seen show in both the northern and southern hemisphere, and he never disappoints! 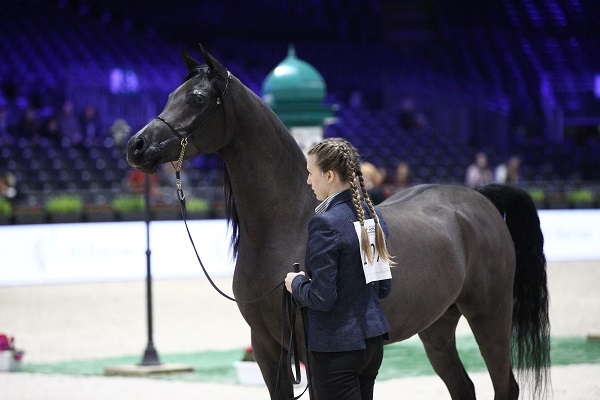 1.57pm: The last horse of the qualifying classes is now in – Kabsztad (Poganin x Kwestura) bred and owned by the Michalow State Stud in Poland. 1.48pm: Okay – there are five horses forward. 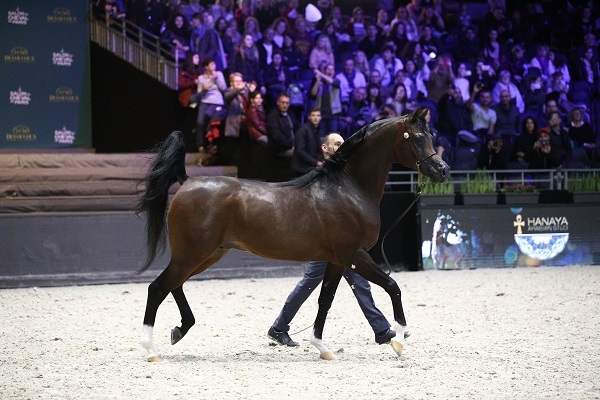 Van Gogh AM (Magnum Psyche x Ynazia HCF) has just shown and he scored 91.75. Bred by Sally Bedeker in the US, he is owned by Asayel Stud in Kuwait. 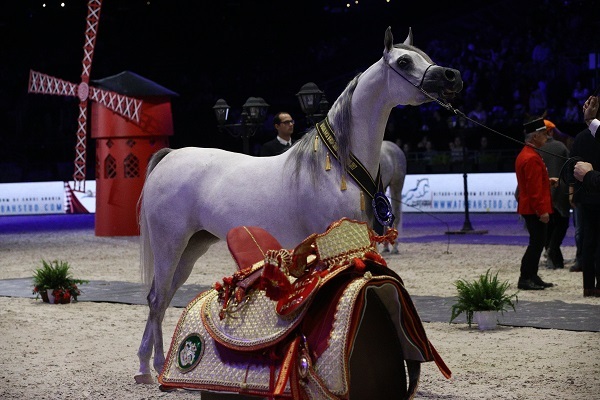 1.28: Here is the class winner, Wadee Al Shaqab. 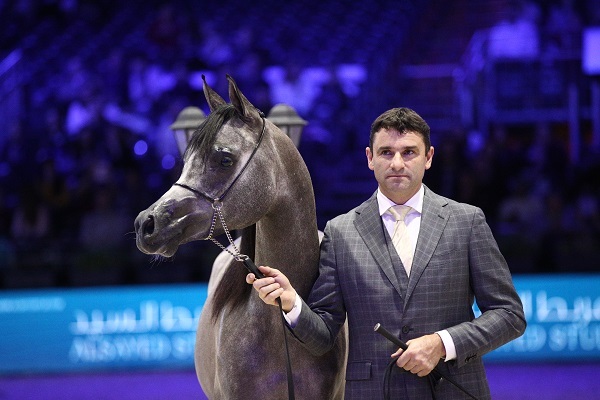 1.22pm: Right – that class finished Wadee Al Shaqab, Equator, Equiborn KA, with Moharib Al Khazna (AB Jamil La Piana x Caterina FM) in fourth for Bin Hamila Stud. Morion takes fifth. 1.13pm: A groan goes up from around the arena as Equator scores 93.75. It seems I am not alone in loving this dynamic QR Marc son; my factoid of the day is that he was Gold the same year as his sire, in 2012. What a horse! 1.11pm: Equator is just leaving the arena – wow! My goosebumps have goosebumps! What a horse… Will he do it though? 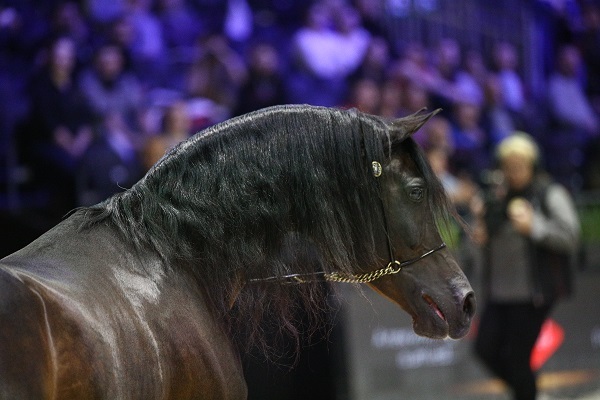 Wadee Al Shaqab scored a huge 93,83 points. 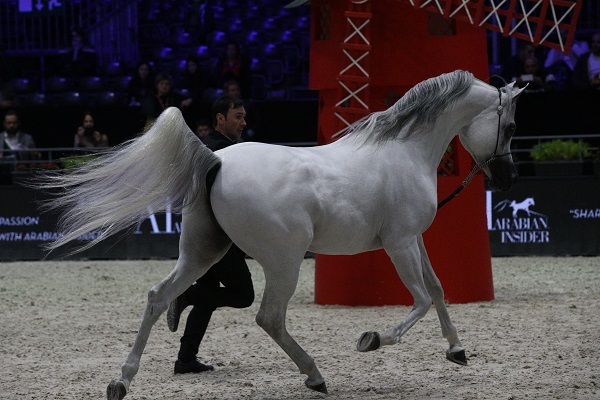 1pm: Wadee Al Shaqab is now doing his show. He was Gold Junior Male Champion here a few years ago and it is always fun when a previous champion returns. He has sired some supber foals and, as lovely as he is, my heart is with Equator. Sorry Wadee! 12.55pm: Equiborn KA scores 92.29. He has been a Bronze and Silver Champion here as a colt – will he walk away with another title this year, now he is a stallion? Needless to say, the competition is tough. Very tough. 12.50pm: The score for Morion is in – 91.08. Equiborn KA now doing his individual show. 12.42pm: What a class this is going to be! Meanwhile here are two shots of the previous winner, Alexxanderr. 12.40pm: Thank you Equator – the first goosebumps of the show! The audience reaction to seeing this Junior Male World Champion back in Europe was beautiful. 12.30pm: Behind Alexxanderr, we have Fuerte in second, Nadeem El Arab (WH Justice x Om El Euphoria) in third; he was bred by Om El Arab and is owned by Aljassimya Farm. 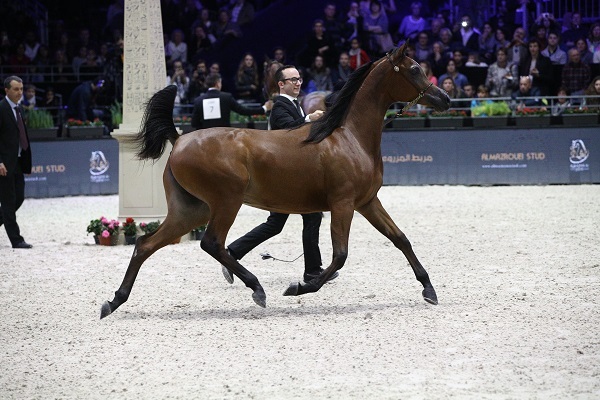 R’adjah de Cartherey (QR Marc x Badi’ah de Cartherey) is fourth, bred and owned by Chantal Rigat of France. I am sorry that I don’t have all the scores – the languages used here are French, English and Arabic, and it is very difficult to keep up, even if you watch the screens constantly for the scores! 12.27pm: A huge score for Alexxanderr – 93.5, including four 20s for head/neck. Congratulations to all his connections! 12.23pm: The Polish-bred Fuerte (Shanghai EA x Frymuszka) always brings a smile, and he has just gone into the lead with 92.5 points. 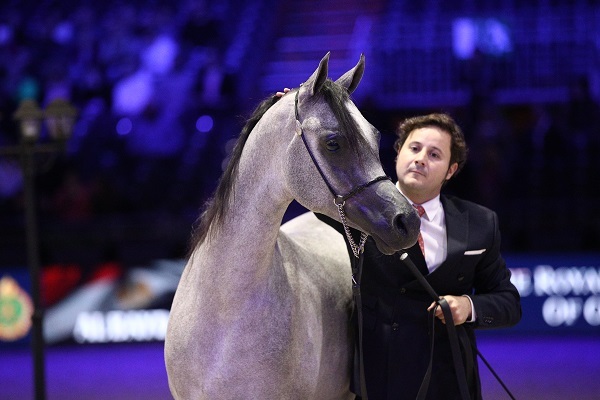 Owned by Abhaa Arabians in Kuwait, he was bred by Jan Dobrzynski. 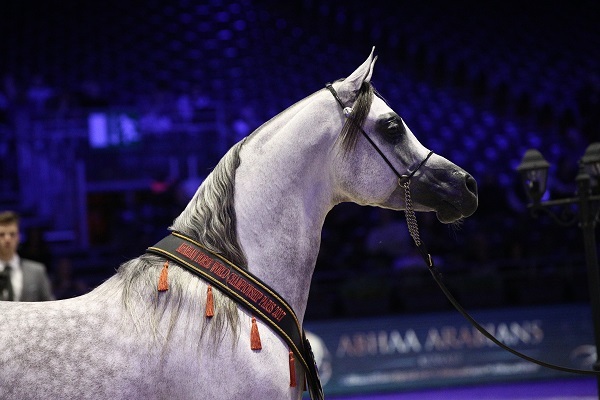 Alexxanderr (Excalibur EA x AR Most Irresistible) was bred by Frances Butler and Brandi Carson, and is owned by Alsayed Stud in the Kingdom of Saudi Arabia. A multiple champion across Europe and the Middle East, he is hotly tipped for Gold here, too. However, Jaal Aljassimya is also a colt of exceptional quality and it will be titanic to see them going head to head tomorrow. 12.21pm: The last horse is in – Alexxanderr. He was bred in the US, and it has been great to see so many horses bred across the Americas and Canada here at the show. The Arabian breed truly does make the world a smaller place and for that, I will always be thankful. 12.03: Here he is – Jaal Aljassimya! 11.48am: Jaal Aljassimya has won the class and following a tie decision, Perseus KA (Espressive x Phirouettes) is second, D Arghad (FA El Rasheem x Krystal Tiara) is third. Those in the UK will remember Krystal Tiara, bred and owned by Andrew and Jackie Atkins, and it is lovely to see a son of hers here. 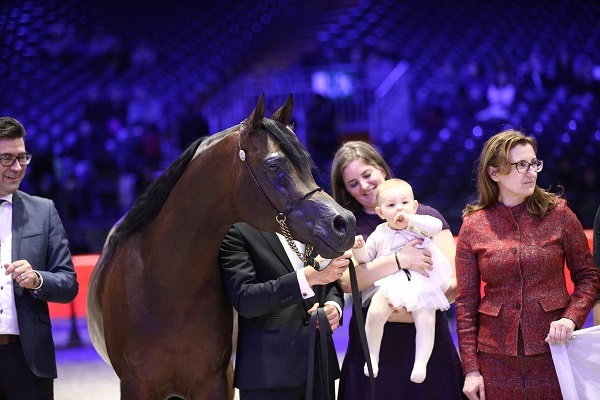 11.37am: We all love the Rae-Dawn breeding programme at The Araban Magazine – here is RD Harenaado, who placed second in the previous class, and is World Top Ten Yearling Colt. 11.36am: The multiple champion Jaal Aljassimya (WH Justice x Annaiss) has just taken the lead in this first colt class. Bred and owned by Aljassimya Farm, he scored 92.5. 11.22am: That’s not to say that there are not some good horses – there are! A couple caught the eye as they came in, and I look forward to seeing them show shortly. 11.21am: No Luigi. This class is thin – just five colts forward of nine. 11.18am: The junior males are in next – Luigi is last to go in this class, and he truly has a huge following. 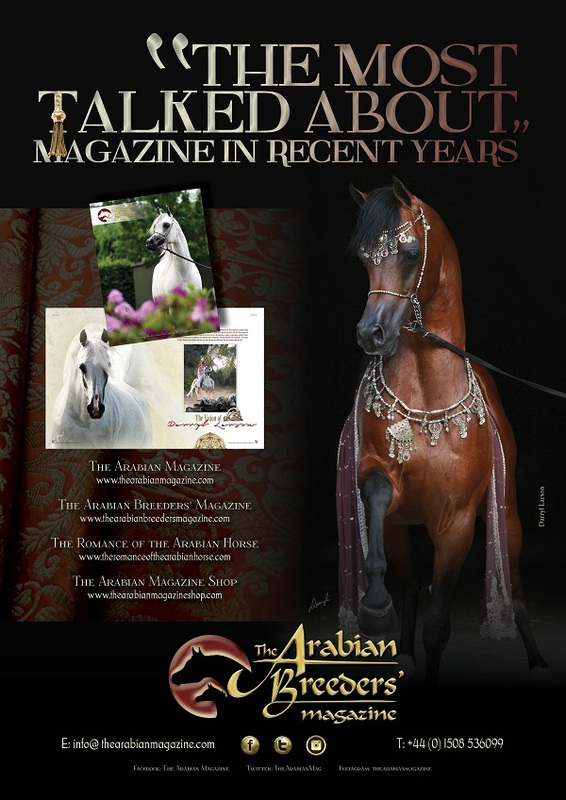 Owned by Al Shahania Stud, he has twice graced the cover of The Arabian Breeders’ Magazine. 11.15am: Here is the class winner, HL El Ganador. 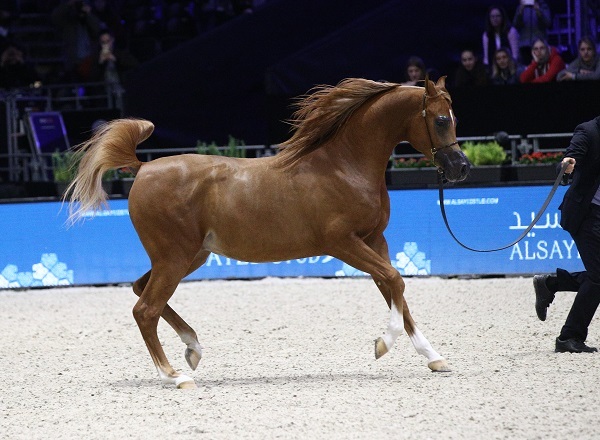 Second was RD Harenaado (Hariry Al Shaqab x DM Endless Romance), bred by Rae-Dawn Arabians in Canada and owned by Woody Arabians of Italy. 11.04am: Here is the winner from the first class, Figaro. 11am: HL El Ganador has gone into the lead of this cass with 92.5 points. 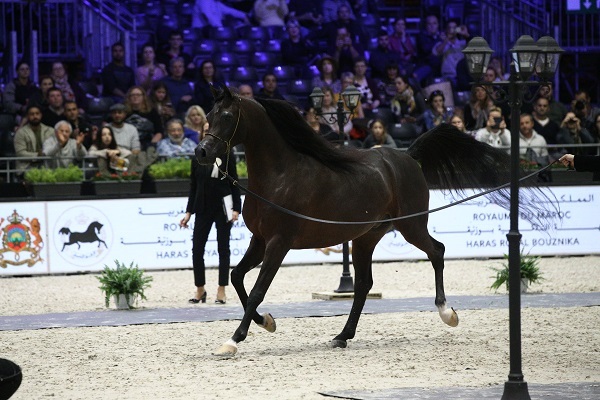 10.48am: HL EL Ganador is now in the ring, kicking off the second class. 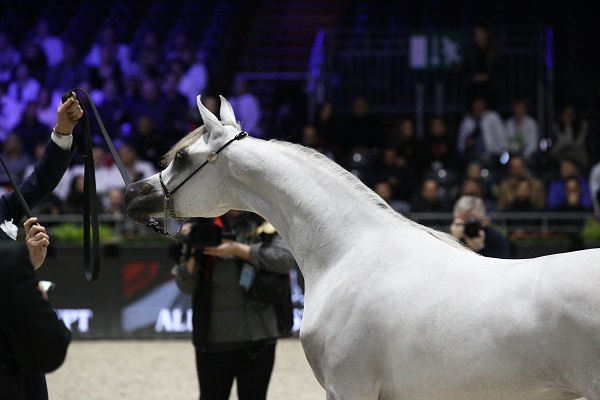 He won at the All Nations’ Cup in Aachen and has a huge following. 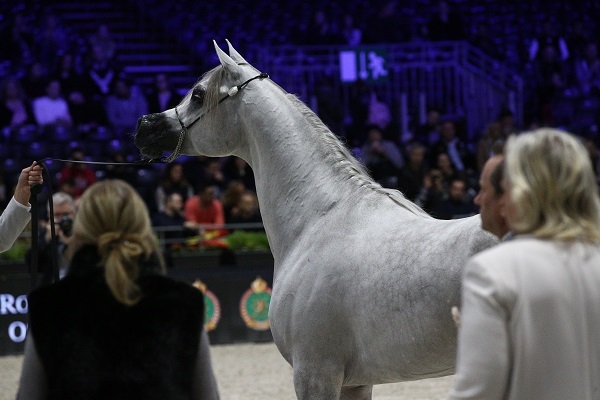 A very smooth grey, he was bred in Chili by Matthei Duch ans is owned by Hanaya Stud of Switzerland. 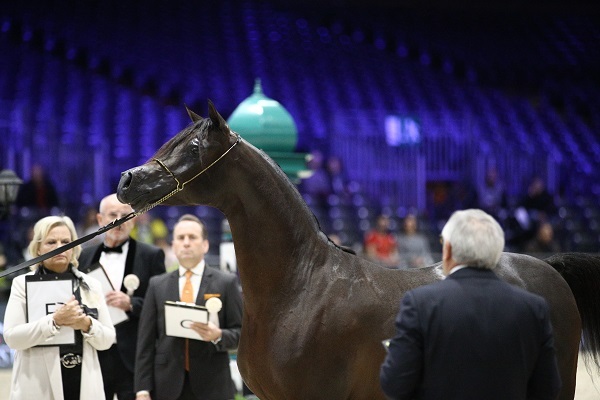 10.38am That’s the first class for today – and it’s a win for Figaro (Wade Al Shaqab x Shirin by Aishia) with a score of 92.7. Owned by Aljassimya Farm and bred by Gladich Fausto. He scored three 20s for head, and he caught the eye of many breeders around the ring. 10.09am: Six colts are here. The top four are guaranteed a place in Sunday’s championships, and then the two highest-placed horses from fifth/sixth place. 10.04am: The first class is being announced, as are the judges. The first colt due in to open today’s show is Percival STC (Excalibur EA x Psytanums Mist), bred and owned by Schoukens Training Center. 10.02am: Luigi fans – he is the last to go in the third class of the morning! Just enough time to finish mucking out the horses and get yourself a coffee. 9.56am: We are getting ready for the first of the yearling colt classes to begin. 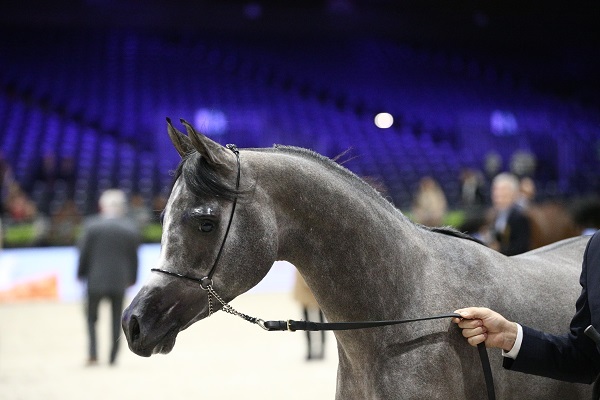 HL El Ganador (HP Shakir Te x Lonco Bay Maria) goes in the second class, and surely he will leave Paris as Gold Yearling Male Champion. We have seven entries in the first class. And a total of 51 horses today to enjoy. 9am: Good morning! Thank you all for the messages overnight, I am glad that so many of you are enjoying this coverage. I thought I’d start the day by sharing these photos of Shirin by Aisha, who placed second in the second mare class yesterday. 7pm: Here is your class winner, Tehama Ballalina. I hope you have enjoyed today’s coverage – we will be back at 10am (GMT+1) tomorrow – see you then! 6.51pm: Yes, Beloved Gracious Lady has the Best Moving Female Award. This is certainly turning into a great trip for Patricia! 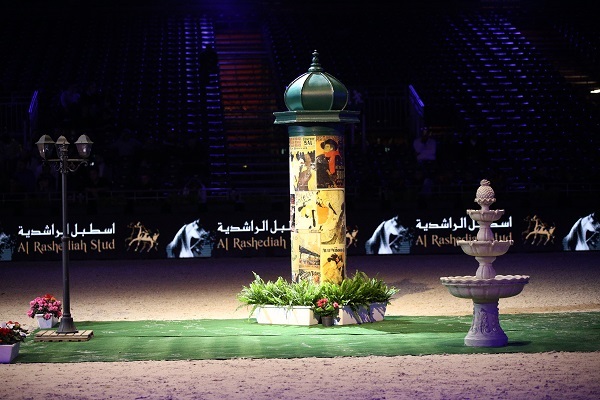 The placings in the last mare class are – Tehama Ballalina, Shirin by Aisha, Anood Al Nasser and EKS Shakira. 6.49pm: Tehama Ballaina has just won it! 93.5! What a result for this stunning class. 6.47pm: That was a lovely show by Tehama Ballalina. We now await her scores, and also the Best Moving female. I think that may well be Beloved Gracious Lady as she had straight 20s for movement. 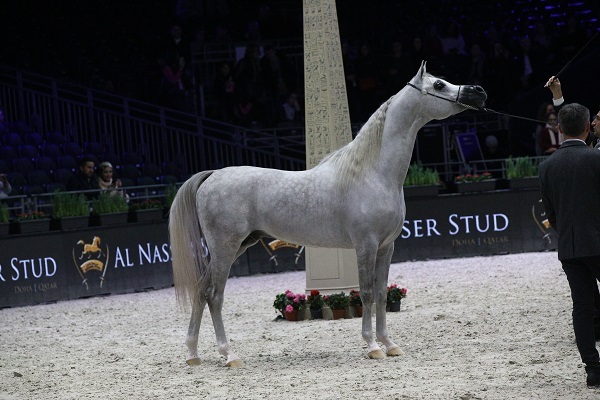 6.40pm: Anood Al Nasser scores 92.33 points, and that is enough to see her through to the World Top Ten. Congratulations! 6.47pm: The Polish mares continue to receive huge applause whenever the come in the ring, and Pilarosa (Al Adeed Al Shaqab x Pilar) has just taken second place with 93.08 points. 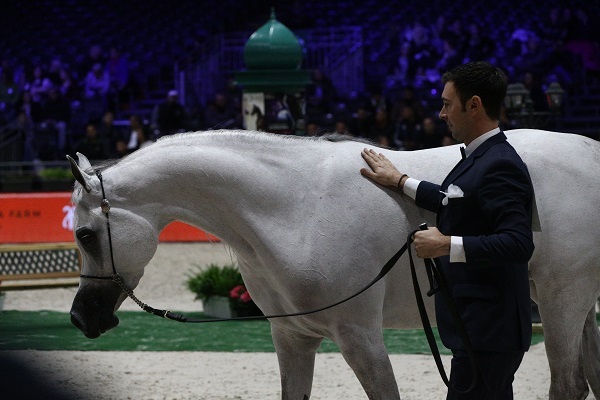 It is great to see these huge-moving mares receive the scores that they deserve. She is bred and owned by Janow Podlaski. 6.33pm: Yes, Shirin by Aisha has gone into the lead with a huge score of 93.08, including three 20s for type and three for movement. Congratulations! 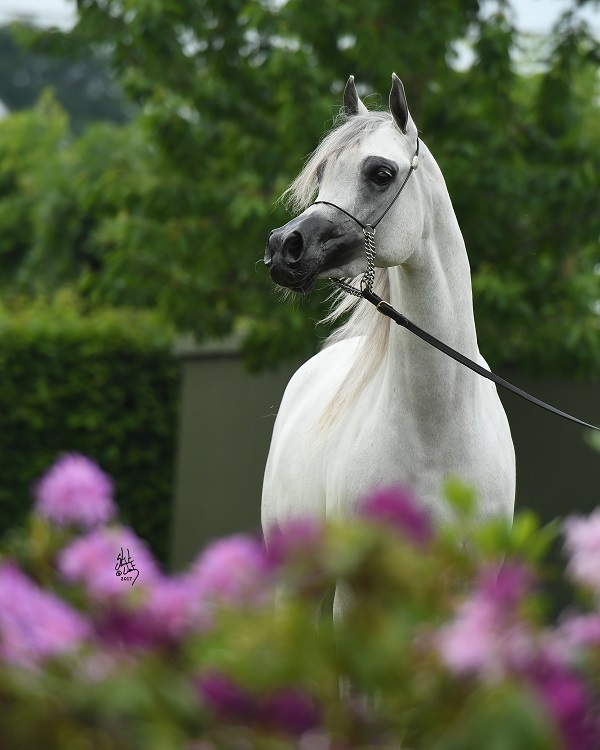 Here comes the beautiful Anood Al Nasser (Ashhal Al Rayyan x Alesyah Al Nasser) for Al Nasser Stud. She stole hearts when she was named Gold in Aachen, and she should comfortably make Sunday’s finals. 6.31pm: The DJ needs to be a bit careful. That’s the second time uncensored songs have been played. 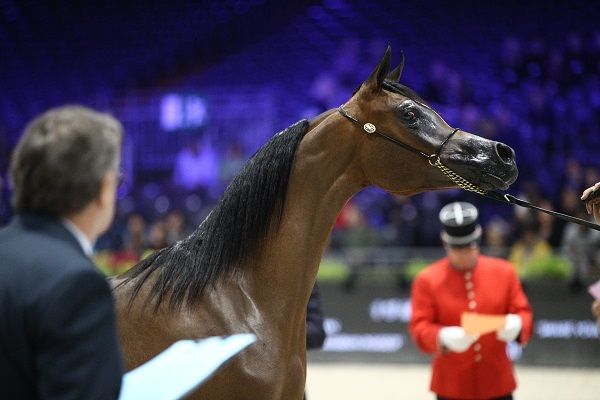 6.29pm: The Royal Cavalry of Oman have gone into the lead with EKS Shakira (Shakir El Marwan x Poetica B), bred by Willi Brown of South Africa, on 91.75. However, with Shirin by Aisha still being judges, I have a feeling that she won’t be in the lead for long. 6.27pm: Here comes Shirin by Aisha (WH Justice x Aisha), bred in Italy and owned by Athbah Stud. She truly is a beautiful mare and is so breathtaking now she is almost fully fleabitten. 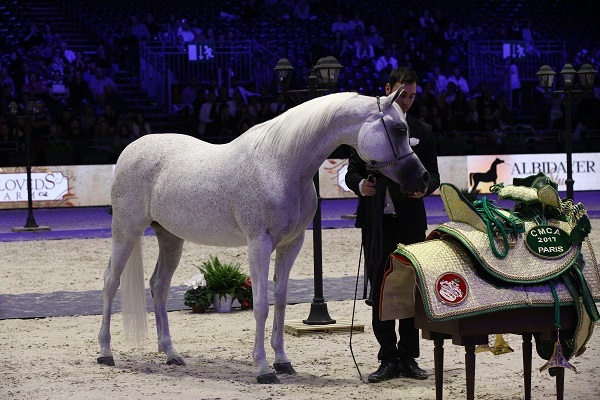 Graceful and elegant, she is the epitome of the perfect show mare for many. She usually receives a glut of 20s for type and head/neck – what will the judges here think? 6.26pm: Hello to all our readers around the world! I have just had a look at the stats, and you are a truly international bunch. Thank you. and I hope that you are enjoying! 6.16pm: What a class this is! Some truly incredible mares in here – I cannot wait to watch their individuals. Meanwhile, here is Delights Divah RB, winner of the first mare class. 6.01pm: Alsayed Stud have their second class win of the day with Delights Divah RB. 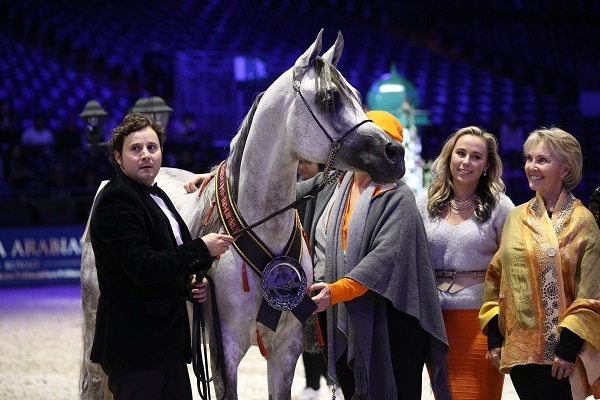 Second place goes to Arwa Aljassimya (Besson Carol x Athina El Jamaal), bred by Aljassimya Farm and owned by Gabi Boaron of Israel. Third is Galerida, and fourth is Bint Hazy Al Khalediah. One more class left today – it is going to be thrilling! 6pm: If it goes to type being the deciding score, then DA Alihandra is World Top Ten. We have the second score sheet, so I can work out who the World Top Ten are. However, there is a tie for the last place, meaning one breeder will be unlucky to miss out. And then there is a tie with Melody J (Emerald J x Maya J) and DA Alihandra (EKS Alihandro x DA Miss Justice), both with 91.42 points. 5.49pm: Delights Divah RB (Ajman Monsicione x Honeys Delight RB) has gone into the lead for Alsayed Stud. 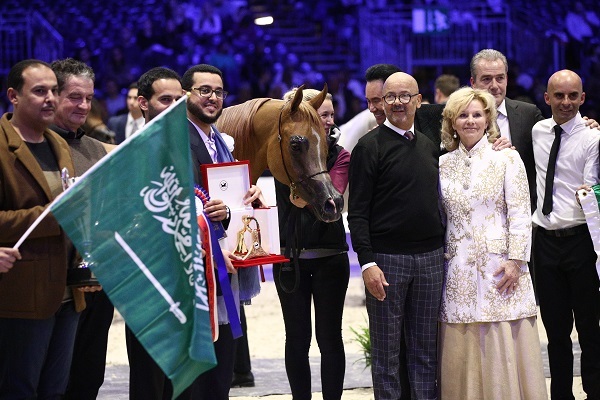 She scored 92.58 points; this is turning out to be a great show for this Saudi-based farm. 5.33pm: Galerida scored 91.92 points. 5.29pm: First in the mare classes is Galerida (Shanghai EA x Galilea), bred by Michalow State Stud and owned by Al Baydaa Stud. This is a lovley mare, one of my favourites on the circuit, and she always shows herself well. 5.27pm: And here she is, the second winner of the junior female classes, Mozn Albidayer. 5.21pm: Photographs will come sortly – the photographer has gone missing! 5.16pm: Just two classes left today. the mares. 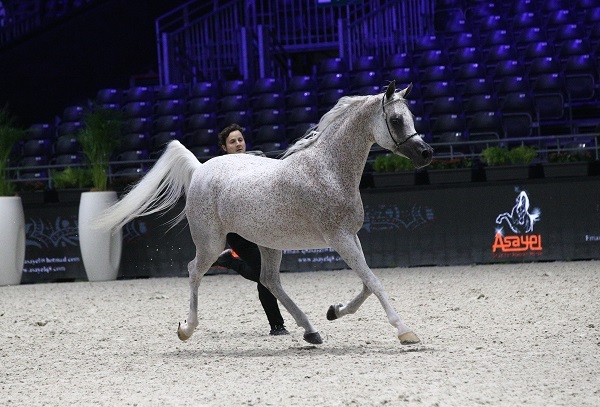 The second group is breathtaking, but there are certainly ones to watch in this first section – Bint Hazy Al Khalediah being just one. She has won so much, and seems to be a firm judges’ favourite. 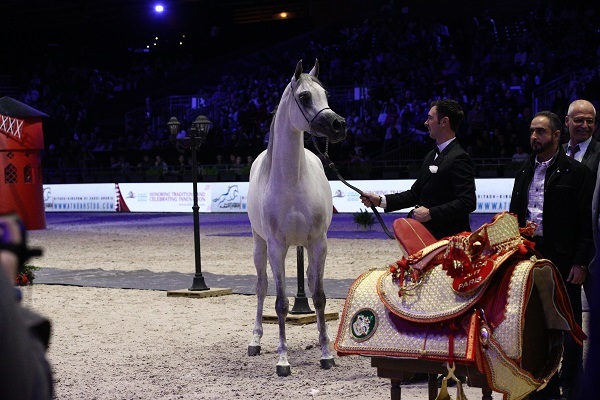 5.15pm: Mozn Albidayer is the clear winner in this lovely class. Second place goes to Malikat Al Malouk, with Bint Seduction HBV in third and Maysah Aljassimaya fourth. 5.11pm: Bambina scores 91 points. 5.08pm: Sahara Angel scores 91 points. The last filly in this class has nearly finished her individual. 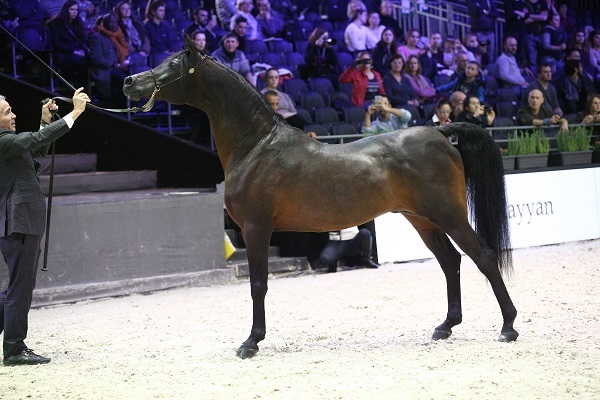 This is Bambina (Kahil Al Shaqab x Bellisa), bred and owned by Janow Podlaski in Poland. The judges are now heading back to their seats, this class is done Just time for Bambina’s score, the Best Head Award, and then the class presentations. Mozn Albidayer is the winner, but I will announce the rest as soon as I can. And then, it is on to the mares! 5.05pm: Sahara Angel (WH Justice x Annjolina) just showed. She was sold at the recent Schoukens Training Center auction fo Al Khashab Stud of Kuwait, and she certainly is incredibly beautiful. She, too, was bred in Brazil, this time at Haras Sahara. 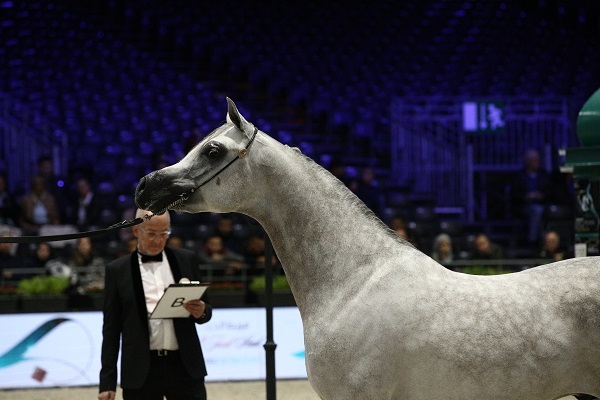 5.04pm: We are now waiting for the scores for Malikat Al Moluk (Mameluk x Asalat Al Hala), bred by Khader Halawa of Israel and owned by Al Khasab Stud. This is one filly you can never underestimate, but she goes into second with 92 points. 5pm: Yes, Mozn Albidayer does go into the lead with 93.08. She is untouchable in this class. I can’t tell you how terrific her scores were as they weren’t shown, but all at Albidayer Stud must be thrilled. 4.54pm: Mozn Albidayer has done a lovely show. This filly is already a US National Champion, a Las Vegas Champion, a Dubai Champion, and an All Nations’ Cup Champion. She gives her all every time, and is such a kind natured horse. I imagine that some big scores will be sent her way, but you can never take anything for granted. 4.52pm: Bint Seduction HBV has gone into the lead with 91.83. 4.50pm: That ‘one more horse’ just happens to be the celebrated Maysah Aljassimya (Monther Al Nasser x RA Marwans Elygance). 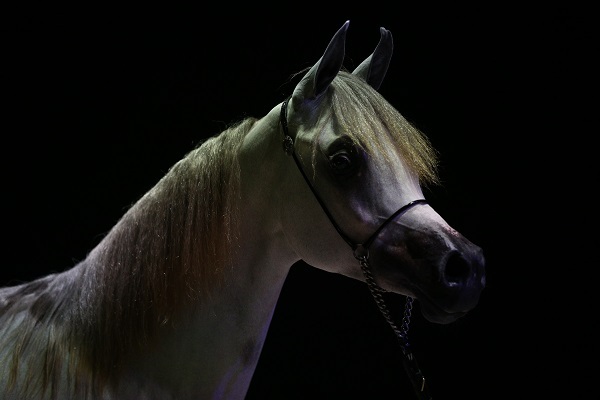 She is bred and owned by Aljassimya Farm in Qatar, and she always does well. 4.47pm: Bint Seduction HBV (WH Justice x Seduction HBV) is now in the ring for Alsayed Stud. She was bred in Brazil by Boa Vista Farm, and she is a firm favourite for many. One more horse after her, and then it is Mozn Albidayer. 4.44pm: I can’t resist sharing a photo of Madinat Al Baydaa. She was pretty much responsible for the rush to breed to RFI Farid after his success as Leading Sire of Paris last year, and she truly is a lovely filly. 4.37: My word, this is an amazing class! Mozn Albidayer, our lovely cover girl, is in elite competition. But then, this is the World Championships, and that’s what you want and expect, really. I think there is just one filly missing. 4.35pm: And here she is, Beloved Gracious Lady. 4.25pm: The class winner of this first junior female section is Beloved Gracious Lady, with Madinat A Baydaa second, Belladonna AR third, and Loulou Al Nasser fourth. 4.17pm: The last filly is now, in, Jawaher Lemar (Empire x Lanckorna), bred and Michalow and owned by Al Jawaher Stud of Kuwait. Meanwhile, Loulou Al Nasser scorees 91.5. 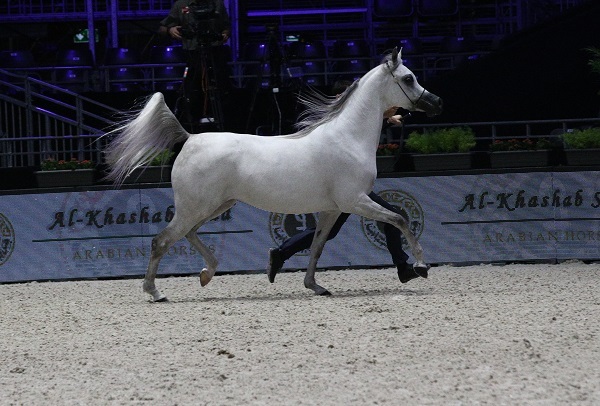 4.15pm: Kamouneh Al Zobair scores 90.75. 4.12pm: The lovely Kamouneh Al Zobair (RFI Farid x Nesj El Khidouna) has just shown for Al Zobair Stud, and now in is Loulou Al Nasser (RFI Farid x Rihab Al Nasser), bred and owned by Al Nasser Stud. 4.08pm: Beloved Gracious Lady scored 92.58 including an incredible straight 20s for movement! Congratulations Patricia! She is the new leader of this class. 4.04pm: Patricia Dempsey brought two horses over from the US, and the second of these has just done a lovely show. This is Beloved Gracious Lady (Bey Ambition x AP Sheez Sassy). It will be interesting to see how she scores. 4.02pm: It has taken a long time but the marks for Belladonna AT (Wadee Al Shaqab x Om El Bellatrix) are finally up. 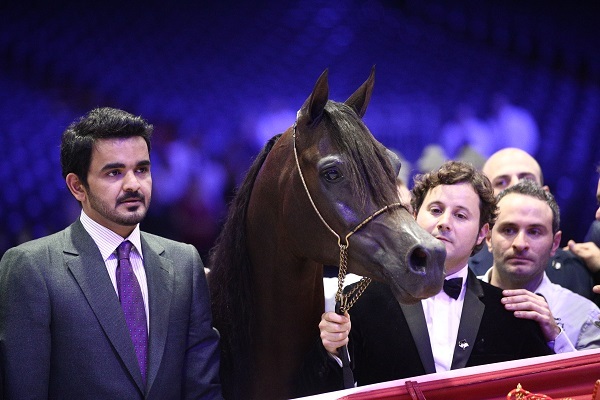 She scores 92.17 for her owners/breeders, Al Thumama Stud from Qatar. I think she is now in second place, but not all the scores have been announced. 3.37pm: The catalogue says that Emanolla was bred at Janow; trust me, it is Michalow. I saw her there as a foal in my last visit to Poland. 3.53pm: Madinat Al Baydaa scored 92.5 and DA Alihandra (EKS Alihandro x DA Miss Justice) is currently second with 91.42. 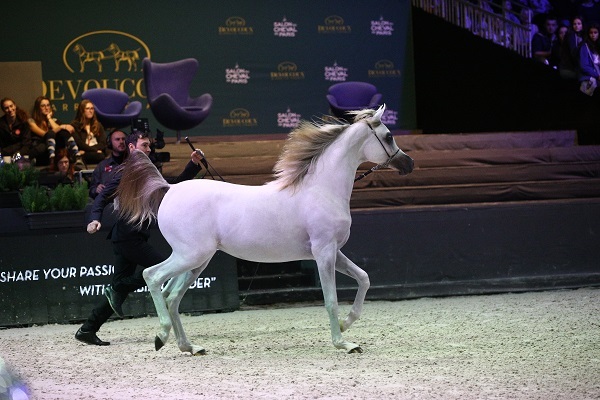 She is bred and owned by Diamond Arabians of Austria. The lovely Emandoria daughter, Emanolla (by Vitorio TO) is currently in the rignt for Michalow State Stud. 3.45pm: I have to say, the ring looks lovely this year with new decoations. Very pretty indeed. 3.42pm: All the fillies are forward in this first junior female section. Madinat Al Baydaa is first to show. 3.39pm: Marilyn has run up from the arena with the latest photographs, and here is your winner, Seranza. Will she be Gold Yearling Filly Champion on Sunday? 3.33pm: The prizes are still being awarded, so a quick peak to the next class. 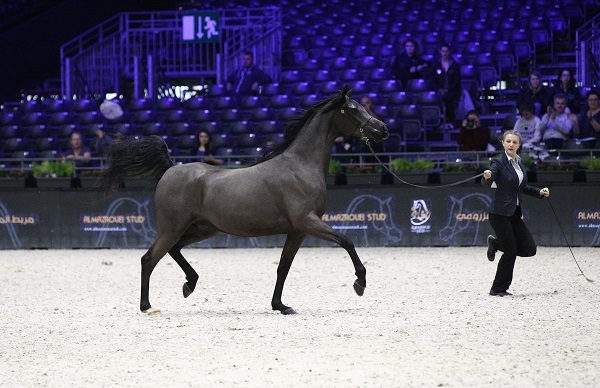 Madinat Al Baydaa (RFI Farid x TS MAdeleine), who left with a medal from last year’s World Championships, is first in. She is bred and owned by Al Baydaa Stud of Egypt. 3.29pm: Seranza comes in to take the top honours for Israel. She is a very feminine bay, and was shown well. 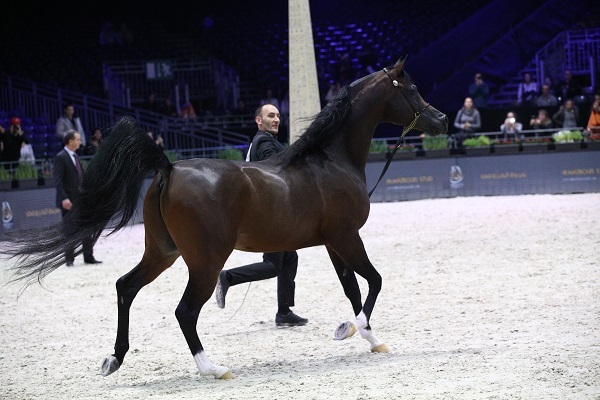 In second we have KZ Fairouz (Fadi Al Shaqab x KZ Nour Al Lail), for Al Mazrouei Stud from the UAE and bred in Israel by Kobi Zirenski and Moshav Kidron. Sweira Aljassimya is third, with Haifa ED fourth. 3.28pm: I can’t even try to guess the placings as the scores aren’t always given at this show. However, I do know that Seranza has won. 3.25pm: Still a lull with nothing happening. I must say, given the quality of the classes, and the later start in the day, the atmosphere is a little flat today. 3.21pm: We are having a little sing along to Nina Simone. 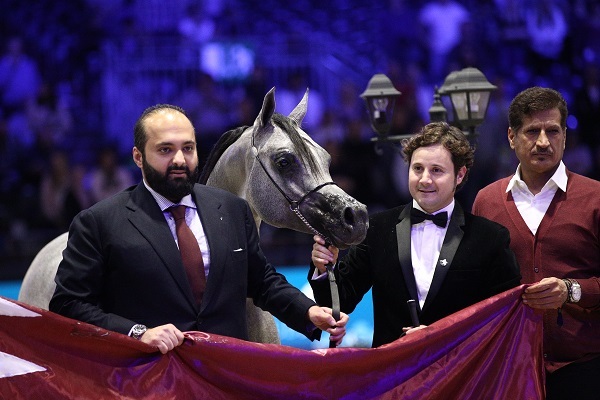 Haifa ED (Kahil Al Shaqab x Prestic), owned by Alsayed Stud and bred by Nasser bin Abdul Lateef Al Fowzaan scored 91.25. The last filly has shown and we are waiting her scores. Then it is the Best Head award – you may recall my theory on them from last year – and the results proper. 3.17pm: Sweira Aljassimya just scored 91.5. I think Seranza has this class in the bag. 3.13pm: Looking forward, the junior female classes are also incredibly competitive. 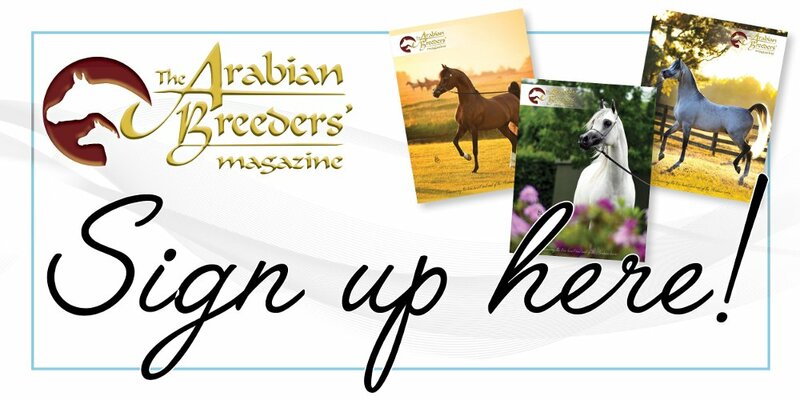 Our current cover star for The Arabian Breeders’ Magazine, Mozn Albidayer is in the second section, and there are some highly experienced filies competing before hand. 3.10pm: Seranza is still in the lead – this is quite a quiet class, after the anticipation of those first three fillies. Sweira Aljassimya (SMA Magic One x Baraka MP) is now showing. She is owned and bred by Aljassimya Farm. 2.56pm: The second yearling filly class is now in, and all eight fillies are forward. 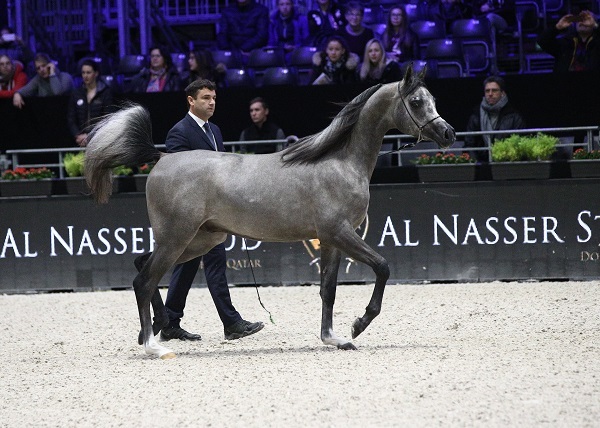 First to judge is GR Shaharaah (Sharahm x TF Shahraaz), bred and owned by GT Arabians of Sweden. 2.54pm: And here is the winner of the first class, hot off the camera! 2.42pm: Jasmeenah Aljassimya is fourth. What a class this was to open the show with – and already, we have a surprise! 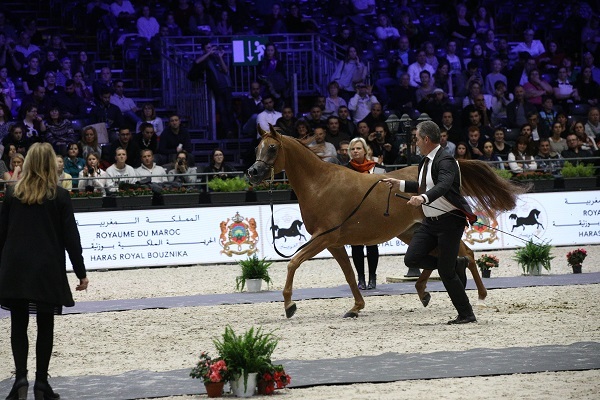 2.40pm: LR Era de Excalibur has won the class – but Om El Erodite is pipped to third place as Yamila OC (Emerald J x Mn Marta), bred and owned by Ganaderia Oc Arabians in Spain is second with 91.42. 2.27pm: Well, that is a little surprising. 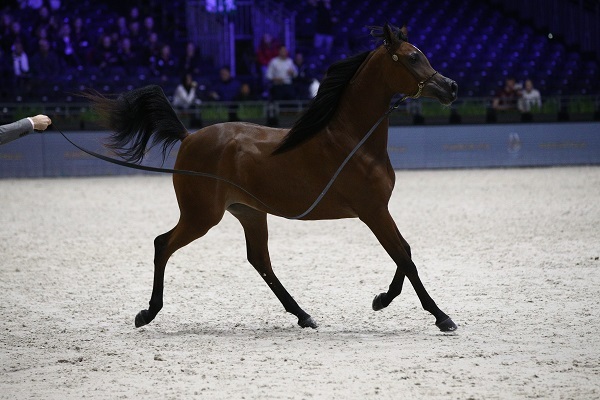 Ghaalyia (SMA Magic One x Gezaana), bred and owned by Julie Kennedy from the UK, scored 89.67. Slightly harsh as she is a very lovely filly, and was Arabian Futurity Europe Top Five. She had the tough job of following those three fillies in. 2.25pm: We can all relax a little bit now. The music is lovely – very French, and one could almost feel that one is strolling down the Champs Elysee. 2.23pm: Well, it looks like LR Era de Excalibur has won this one! Jasmeenah Aljassimya scores 91.08, including two 20s for head. 2.20pm: Her scored included one 20 for type and two for head/neck. 2.19pm: Om El Erodite scored 91.33. 2.17pm: Her score included two 20s each for type and head/neck. Jasmeenah Aljassimya is now showing. 2.16pm: The scores are in for LR Era de Excalibur – 92.08. 2.13pm: Here comes Om El Erodite – to huge cheers! I saw her owner, Patricia Dempsey, on the way in. She said that she is not nervous, just happy to be here. She looks in super condition, and has acclimatised well from her travels from the US. 2.11pm: LR Era de Excalibur opens the show. She is barely a year old, having turned one just nine days ago. She was bred in Uruguay, hence her late date of birth. 2.05pm: And we are in! The usual rush as the VIP opens on that first day always means that people are taken unawares and they miss that all important first few moments of the show. We have seven entries forward – the walk around is almost over, and the first in to be judges is LR Era de Excalibur.